A Detroit Lions linebacker who recorded a single tackle this year got his first sack of the season early Saturday inside a Queens stationhouse — when he flew into a rage and allegedly pummeled an NYPD sergeant, officials told The Post. Trevor Bates, 25, was arrested around 3 a.m. for refusing to pay a $32 cab fare in front of the Hampton Inn Hotel on Ditmars Boulevard in East Elmhurst, officials said. The 6-foot-2, 247 pound Bates– who had a stint on the Giants practice squad in 2017– was taken to the 115th Precinct for processing, and flew into a rage, sources said. A sergeant came over to try to calm the Westbrook, Maine, resident, who was irate in his holding pen, officials said. It took multiple cops to subdue the raging player — and even a Taser didn’t help, Mullins said. “They Tazed him and he ripped the prongs out,” the SBA president told The Post. NFLer was taken to Elmhurst Hospital Center for a psychiatric evaluation, where he remained Saturday afternoon. He will be charged with second-degree assault, obstructing governmental administration, theft of services and resisting arrest. If convicted, Bates faces between probation and up to seven years in prison, according to Queens District Attorney Richard Brown. The sergeant was taken to New York Presbyterian Hospital-Queens, where he was released after being treated for a concussion and received three stitches above his eye, cops said. Bates, who was a standout defense man for the University of Maine Black Bears, was a seventh-round draft pick by the Colts in 2016. 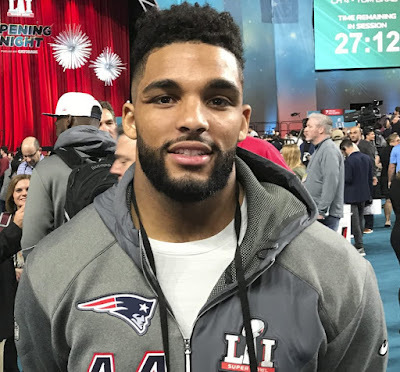 The next year, he won a spot on the New England Patriots practice squad –and was a member of the team when it won Super Bowl LI. The linebacker’s mom, Christy Bates, of Westbrook, Maine, was stunned by the news, she told the Post. “He’s a great guy,” she said. “I’m waiting to hear back from the doctors,” she added. Bates was “frayed from the season,” the pal noted. Both said that Bates was coming home on a connecting flight to Maine, but were not immediately able to provide more details. The hotel he was getting dropped off at is across the Grand Central Parkway from LaGuardia Airport. Bates portrays himself as a devout Christian on his Twitter profile. “He called you out of darkness into His wonderful light,” his cover photo says, a reference to a Scripture reading from the book of 1 Peter. Continuing down a path God granted me. All trust in Him !